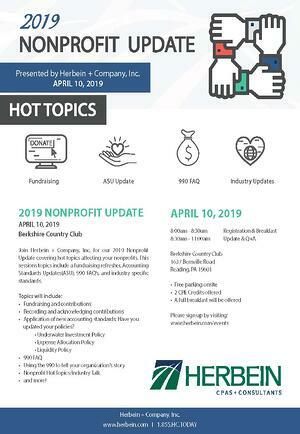 Join Herbein + Company, Inc. for our 2019 Nonprofit Update covering hot topics affecting your nonprofits. This sessions topics include a fundraising refresher, Accounting Standards Updates(ASU), 990 FAQ’s, and industry specific standards. Application of new accounting standards: Have you updated your policies?